Your instant dose of glamour, these 0.37 Carat t.w. 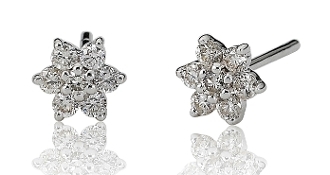 brilliant round cut Diamond earrings are versatile, and perfect to wear from day to night. Crafted in 14 Karat white gold these post style earrings feature a 6 prong setting which complements the design and adds eye-catching appeal. The high quality push backs secure to keep them perfectly aligned, just like the stars above.